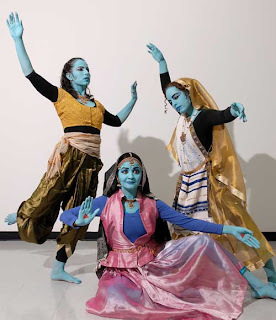 "Rang de Nila" or Color Me Blue, a unique performance combining dance, music, and art received overnight fame when it was first performed in 2006. In the routine, dancers assumed the roles of characters in artist Siona Benjamin’s paintings and charmed the audience with their movements, depicting the myriad emotions of a woman and her dramatic transformation. 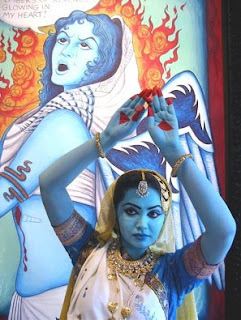 The face of the dancers––Pranita Jain and Ishrat Hoque Rakhi ––are painted blue or “Nila” to symbolize the artist’s own identity as a Jewish woman of color. At one point during the performance, Benjamin stood onstage and mimicked painting against projections of blue female faces expressing love, anger and joy. Since then, Rang de Nila has attained a legend-like status in the world of performance. New Jersey based Benjamin, originally from India, is inspired by traditional styles of painting, like Indian/Persian miniatures, Byzantine icons and Jewish and Christian illuminated manuscripts. In her work she blends those with pop cultural elements. Her work clearly reflects her multicultural upbringing. "Having grown up in a predominantly Hindu and Muslim society, having been educated in Catholic and Zoroastrian schools, being raised Jewish and now living in America, I have always had to reflect upon the cultural boundary zones in which I have lived,” notes Benjamin. Benjamin received a fellowship from the New Jersey State Council on the Arts and the New Jersey Print and Paper Fellowship from Rutgers Center for Innovative Print and Paper of Rutgers University. She earned an MFA degree in painting from Southern Illinois University and a second MFA in theater set design from University of Illinois at Urbana-Champaign. Her work has been featured in the New York Times, The Chicago Tribune, The Jewish Week in NYC and NJ, The Boston Globe, Art in America, Art New England, Art and Antiques, Moment magazine and Nashim-A Jewish Feminist Art Journal. On Sunday, April 19, Benjamin is invited to Mizel Museum in Denver to present her work. The event is organized in collaboration with Denver and L.E.A. Chapters of Hadassah. It will include art exhibition and entertaining performance by the blue dancers. Benjamin will also conduct a Miniature Painting Workshop at the museum the next day. See the museum website for more information. Siona is a master artist. Her paintings evoke emotions too deep to describe for an admirer. It must be almost surreal for a visual artist to see a demonstration of their work. Performance is probably an ultimate validation of an artist's work.